On Sunday, the Jets had the ball deep in Arizona territory and a one-point lead. The directive came in from the Cardinals' sideline: Let them score a touchdown, so Arizona could get the ball back down eight with more than a minute remaining. Sound advice, though it was mooted when Shonn Greene intentionally slid at the one-yard-line rather than score, and the Jets knelt to run out the clock. DE Darnell Dockett wasn't happy with the strategy, and he made it known to his teammates. Safety Kerry Rhodes came over to try and convince him letting New York score was the right thing to do. Dockett and Rhodes got into a heated argument on the field—Florio says Dockett spit on Rhodes, Rhodes denies it. It doesn't really matter, because the Cardinals have much bigger problems, but Dockett has apologized to Rhodes for the run-in. 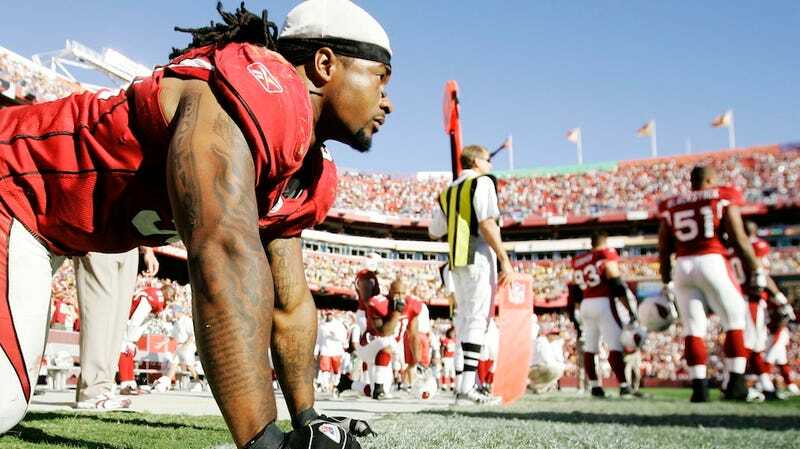 "It's something that I don't believe in, something that I didn't understand," Dockett said. "It was frustrating at the time. At the end of the day, I am never, never going to lay down and quit. I've been playing football for over 20 years. I've given this organization, I've given Florida State, I've given my high school everything I've got. I love the game. I play with passion and I'll never quit." This apology is just fantastic, because it's obvious Dockett still has no idea why he was in the wrong. He talks about "not quitting" as if letting the Jets score would be quitting, instead of the only thing that would give the Cardinals a chance to win the game. I get that players are wrapped up in their individual units and don't have the time, or sometimes the ability, to see the larger picture—but that's why you just do what the coaches tell you. It's their job to figure out this stuff. The Cardinals should be less concerned with Dockett's feistiness toward a teammate and more concerned with the fact that he doesn't understand football strategy, and shows no inclination to learn.